It was a great moment for American politics yesterday when President Obama and New Jersey governor Chris Christie strolled to the podium together after visiting the Jersey shore. It was a remarkable moment, one that Americans starved of political grown-ups could favor. It was state and federal working together. It was two men submerging their political differences for the common good. They made a political odd couple, the tall, muscled African American president and the roly-poly governor who clearly never passes a donut shop. But together they pulled the lever on co-operation for the common good, the one part of politics that the vast majority of Americans want to see from their politicians. In the shadow of the presidential election it was a far greater risk for Christie and for his political future. Already there is a cacophony on the right that he should have invited Romney too. “Et Tu Christie” was one of the less profane headlines. But there is only one president, the man who holds the purse strings on federal aid. Christie is known as a governor who gets it done and this time all politics was local, not national. 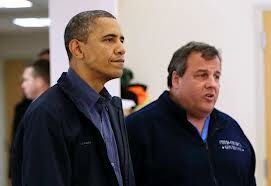 By embracing Obama, Christie ensured that federal help would be even more swiftly dispatched and that his state would be at the front of any line. For Obama the idea of appearing with the man who slammed him at the Republican convention where he was keynote speaker must have seemed somewhat surreal. But Hurricane Sandy has changed the dynamic of the presidential campaign and the catastrophe surrounding the hurricane has taken the media attention of the horse race. I think both men will benefit from their meeting and their joint efforts to help the distressed residents of New Jersey. In the long run if Romney is defeated and Republicans are looking for a moderate in 2016 they can look no further than Christie. For Democrats the short term win is for Obama but the big winners are the American people who can finally see how politics can work for the benefit of the people and is not all about name calling.